The Book Chook: Let's Celebrate Australia Day with Books! 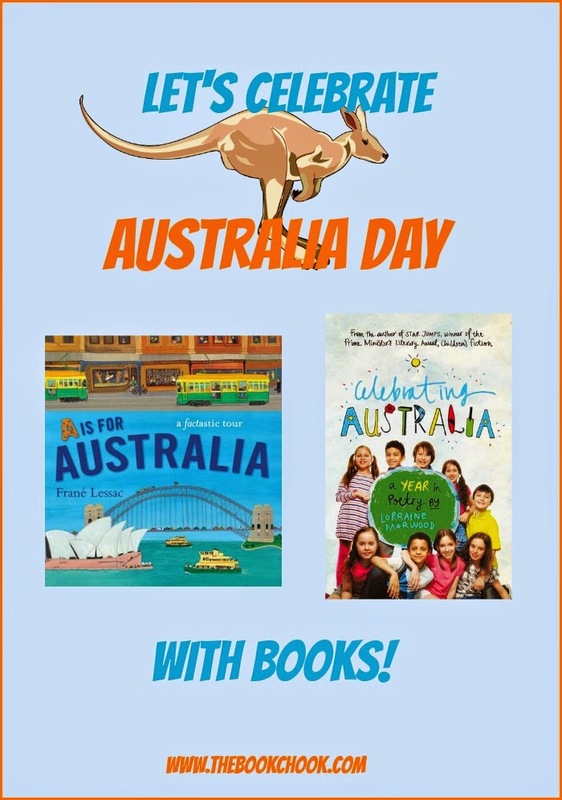 Let's Celebrate Australia Day with Books! What better way to celebrate Australia Day than by sharing books with our kids? Here are two recently published books that I believe will make outstanding resources for home, school and public libraries: Celebrating Australia: A Year in Poetry by Lorraine Marwood, published by Walker Books Australia, 2015, and A is for Australia by Frané Lessac, published by Walker Books Australia, 2015. Celebrating Australia is a collection of poetry by Lorraine Marwood, one of my favourite Australian children’s poets. I have previously reviewed Guinea Pig Town and Other Animal Poems and A Ute Picnic and Other Australian Poems. A is for Australia is such a visually exciting book. I love Lessac’s illustrative style, and have previously reviewed Simpson and his Donkey and Midnight. Kids will love delving into A is for Australia. Its visual appeal is huge, with brightly-coloured single and double-page spreads, dotted with occasional pertinent facts. Lessac used gouache on arches paper. Truthfully, I don't actually know what that means, just know I love the artwork! A factastic tour of Australia from A to Z with award-wining author and illustrator Frane Lessac. What is the Fremantle Doctor? Where is Qui Qui? And why are some islands named after days of the week? You'll uncover these exciting facts when you explore the A to Z of Australia - from Bondi to Kakadu and all the way to Taronga Zoo. Discover why Australia is one of the most amazing countries in the world! There are lots of lesser-known Australian places featured in this beautiful children’s picture book. I is for Iron Pot Lighthouse in Tasmania, Y is for Yallingup in WA, and O is for Oodnadatta, SA. I really appreciated the thoughtful choice of facts for each topic - most relate to themes covered at school; many are quirky, adding information to parts of the pictures; all are designed to grab children’s interest. If you’re interested in acquiring still more great resources about Australia for your home or library, don’t forget my recommendation of these beauties: The Big Book of Australian History by Peter Macinnis, Australian Backyard Naturalist by Peter Macinnis and An Aussie Year by Tania McCartney and Tina Snerling. Check out A Swag of Australian-themed Picture Books, and my list of general ways to find Great Australian Children’s Books. Wishing all my Aussie friends a safe and happy Australia Day 2015! You might also like to read Let’s Celebrate Australia Day with Boomerang Play! Yah a review of my book! So glad's its appreciated. The books was an enjoyable challenge to research and make poetic in a variety of ways all that we celebrate through the year- some days were definitely more challenging than others to make poetic. Thank you for your review! I can truly imagine what a challenge it must have been, Lorraine, but the whole collection comes across as effortless and lyrical. I'm thrilled to have reviewed your moonbeams and sundreams.